a marathon at 100 years old!?!?!? i wanted to write a post about the 100-year old Fauja Singh who finished the Toronto marathon last week. most of you probably already heard about this, but for those of you who've been living in a cave you might find this of interest. admittedly, this post is a little late, but i wanted to wait until they could confirm his age. unfortunately, it appears they can't (Guinness World Records requires that he show his birth certificate, but he's unable to furnish one: http://www.bbc.co.uk/news/uk-15370205 ). however, based on what i've seen, i've come around to taking him at his word and figure i'm willing to accept that he's 100.
i have to say that this is flat-out impressive. yeah, sure, some might say he took more than 8 hours, and that you can walk a marathon in that time. but 100 years is still 100 years, and i'd challenge anybody to do a marathon at that age. i know people in their 50s who can't do it--and i even know people in their 20s who can't do it. what gets me even more about this story is that 1) he only started running at the age of 89, and 2) this is his 8th marathon. !?!?!?!?!? holy smokes! it just goes to show you: it's never too late to start sports. no matter what your age, you can still start, you can still improve, and you can still participate in an active lifestyle, and do so in a way that is rewarding and meaningful. Toronto (AP) — A 100-year-old runner became the oldest person to complete a full-distance marathon when he finished the race in Toronto on Sunday. 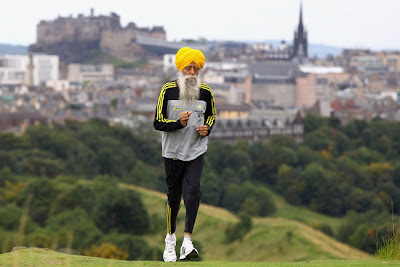 Fauja Singh earned a spot in the Guinness World Records for his accomplishment. It took Singh more than eight hours to cross the finish line — more than six hours after Kenya's Kenneth Mungara won the event for the fourth straight year — and he was the last competitor to complete the course. But his time wasn't nearly as remarkable as the accomplishment. Event workers dismantled the barricades along the finish line and took down sponsor banners even as Singh made his way up the final few hundred yards of the race. Family, friends and supporters greeted Singh when he finished the race. "He's absolutely overjoyed, he's achieved his lifelong wish." Sunday's run was Singh's eighth marathon — he ran his first at age 89 — and wasn't the first time he set a record. In the 2003 Toronto event, he set the mark in the 90-plus category, finishing the race in 5 hours, 40 minutes and 1 second. And on Thursday in Toronto, Singh broke world records for runners older than 100 in eight different distances ranging from 100 meters to 5,000 meters. The 5-foot-8 Singh said he's hopeful his next project will be participating in the torch relay for the 2012 London Games. He carried the torch during the relay for the 2004 Athens Games. as part of the social conscience function of this blog, i'd like to note that today, October 16, is Blog Action Day 2011.
i'd almost forgotten about it. but thanks to the organizers for sending out a courtesy message to everyone who's supported it in the past. i've participated in Blog Action Day in past years (reference: Blog Action Day 2010 & Blog Action Day 2009), and it's something i always enjoy supporting. i know that Blog Action Day has already begun in the time zones ahead of me, but i figure i can still make a difference. so this is my post for Blog Action Day 2011 (#BAD11). i suspect most of you who read this blog share my love of food. anyone who maintains an active lifestyle also maintains an elevated metabolic rate which entails a high calorie demand. if you're like me, you don't want the same kind of calories all the time, and given the volume of caloric intake, this invariably means that we develop a more discriminating attitude regarding nutrition. having said that, i think we tend to forget the significance of those calories. at least in terms of the resources necessary to produce and distribute them. most of you, like me, live in societies where food is largely available whenever we want it. even in a tight economy, most of you are in countries or communities where you can get food if you want it. there is also a very good interactive map provided by the World Bank (reference: http://data.worldbank.org/indicator/SH.STA.MALN.ZS/countries?display=map ). 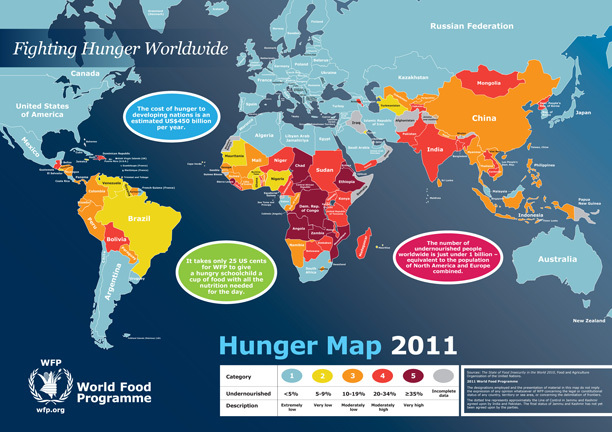 the issue that's driving such undernourishment in the world is not one of food production but rather food distribution. there's enough food being produced to feed the world, but commodity prices, endemic instability, and transportation challenges are preventing food from being available to everyone--particularly to people in areas who need it the most. and the scale of the suffering is vast. which is why i think that we have to do 2 things: 1) appreciate that what we have can meet our needs, and 2) act to help those who do not have enough to meet their needs. i want to encourage people to think about ways that they can help. even if we can't personally provide food to the starving in distant lands, we can still provide aid to the organizations that do. and we can also try to take steps to address overall global hunger by helping the starving in our own communities. i know times are tight and the economy's bad. but that's why i think it's even more important to think about those suffering from undernourishment. because as bad as things are for us, they are much worse for them. given the apparent continuing resilience of amateur sporting events in places like the U.S. & Europe, my suspicion is that for most of us "bad" means having to cut back on race registration and training supplies; for so many other people in the world, "bad" means death. i think we can do a something to rectify the karmic imbalance. even if just a little. besides, if we really are as good as we'd like to believe we are and as good as we always say we are, at some point it means we follow through on the meaning of that word. and make it so that it means more than just "good" as in performance or fulfillment, but "good" as in making the world a better place...especially since they ultimately end up being the same thing. i'm sure most of you who follow this blog were among the many who mourned the passing of Steve Jobs last week. his death seemed to touch a chord that resonated with many people across a broad spectrum of humanity. it affected me the same way, and i'm finding myself moved to write up a post, even though his life had very little to do with the nature of this blog. although, in a way, it does. Jobs, and Apple, always held to an iconoclastic attitude. that spirit was exemplified by the slogans and themes adopted in Apple's marketing campaigns--all of which proved to be in touch with a larger audience that sought an aesthetic apart from the monotony so typical of the digital age. yeah, i know, it's commercial claptrap. corporate gobbledygook. random post-modern nonsense cooked up by one of the giants of the advertising world, TBWA/Chiat/Day. except that you realize it's a reflection of a persona. of one man. and an entire population of people who, literally and figuratively, bought into that message. and i think i know why: it hit upon a truth that i think most people understand, even though they might never be aware of it. you see, to think different, to be creative, to be unique, to be independent, to generate new and different and strange and interesting ideas, that act is not easy. not so much because of talent, because in a world composed of billions of people that have lived throughout all the ages of humanity there has been and continues to be no shortage of supremely talented individuals. but more so because of what it takes to apply that talent. and that is to make the decision to exercise that talent. to think about new ideas. especially in a world that is not always receptive to them. it's easy to forget--or never know--that the figures we so often laud for creativity were during their times so often for so long not respected nor recognized nor accepted nor admired. instead, they were by various degrees in various ways despised, feared, reviled, hated, alienated, ostracized, ridiculed, mocked, attacked, alienated, persecuted, suppressed, repressed, oppressed, and, in some cases, even beaten, tortured, and assassinated. they weren't seen as creative; they were seen as crazy. all for deciding to assert their ideas. which is where i think we find a common connection. any of you who follow this blog, whether already an endurance athlete or contemplating becoming one, knows what that word means. courage to pursue a sport that so much of the world does not understand. courage to face challenges so difficult to comprehend. courage to continue when so many do not even begin. courage to face yourself and what you are and to dream of making yourself something different. and the courage to then act to realize that dream and be something different. it's the same thing. because realizing a dream means the assertion of an idea. an idea that different means better. even as the world may think it means crazy. it takes courage. and courage is not easy. which is why we should respect it anytime we see it. 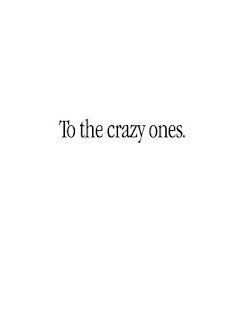 so here's to the crazy ones. the mountains make you strong. it's an oft-repeated maxim in training. trails and roads help to build endurance. the track and intervals help to develop speed and technique. but for strength, you go to the mountains. the mountains give you strength. the physical strength for muscles and sinew to continue churning and turning even as the incline rises. the cardiovascular strength for lungs and heart to keep breathing and beating despite an increasing load. but above all, and most importantly, the mental strength of character to keep going uphill against all obstacles in all terrain in all conditions while still wanting to take on more. anyone can go fast. anyone can accelerate. but to be strong, to stay strong, in the face of challenges that repeat, that attack, that persist, that increase, that grow, that rise ever higher and higher and higher and higher and higher and higher so that every hill only reveals another, higher, steeper, harder successor...that can only be learned from the real thing. the source. the mountains. 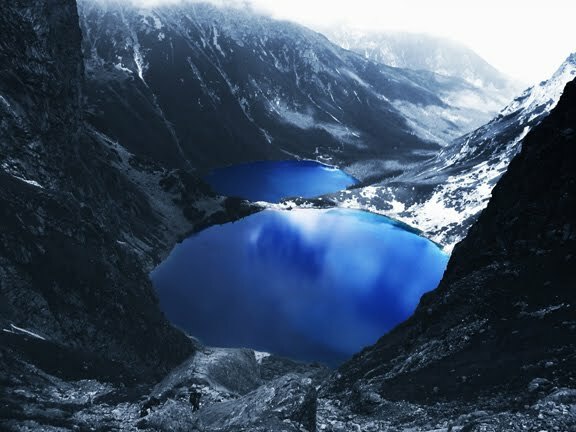 the mountains have existed through the passage of untold millenia, eternal as the messages of time carved upon the patterns and shapes and colors of the rocks. they have stood vigilant beside the eons, impervious to the whispers of the seasons that linger through the valleys and peaks and ridges of the crests. they have seen the maturing of the sun and the gathering of the moon and the multiplication of the stars flung across the abyss of night to fill the sky to bridge the void to reach the side that signifies the beginning of the edge of infinite. they have seen these things. and they have listened. and smelled. and tasted. and felt. and come to know it all as wisdom. marked great and vast upon the face of the ages. and this they keep. because they know its value. on a scale beyond the comprehension of the tiny creatures that dare to clamber upon the glories of the hills. and because they know its value, they know it can only be understood by those who can respect its meaning. and that form of respect only comes with appreciation, and that form of appreciation only comes with experience, and that form of experience is only earned by those who accept the strength to rise as high as the message being imparted. the mountains have much to share, if you let them.